It is amazing what improved accessibility and a few labels and organization can do to your spirits! In that cabinet stuck in the corner - we always fought with it! 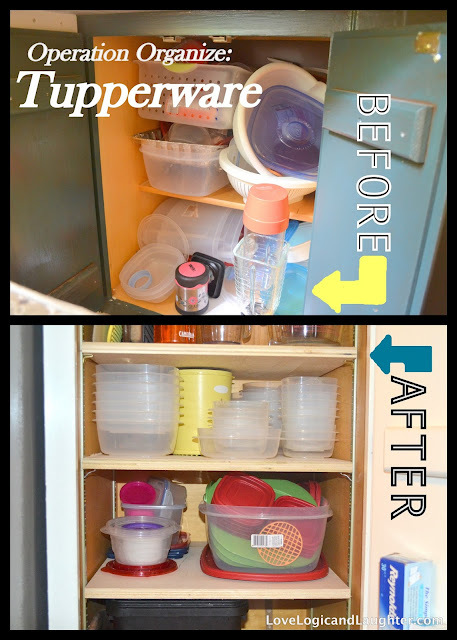 The first solution was to move the tupperware to a more accessible location - that way it will stay organized! This cabinet (below) is located directly to the right of the fridge. Most tupperware goes into the fridge anyway - so perfect new location! Next, all the tupperware was sorted. A lot was thrown away - we had several containers that looked like they had been to war so they were discarded. Others were thrown away because they were either missing a lid or they were not really tupperware (containers we had kept from store bought food). All the others were organized and stacked by size . The lids were all thrown into a large tupperware container. Finally, the shelves were labeled. When labeled no one has an excuse to not know where something goes. So I labeled all the shelves as follows: Top Shelf - Cast Iron and Clay Bakers; Second Shelf - Cutting & Cooking Boards on Left, Mixing & Measuring Bowls on the Right; Third Shelf - Tupperware Containers; Fourth Shelf - Odd Tupperware on Left, Tupperware Lids on Right; Bottom Shelf - Recycling on Left and Baggies on Right.